While tungsten bands are taking the wedding ring market by storm, they are also becoming a popular solution as engagement rings for both men and women. When we think of a marriage proposal, the traditional means is for the man to propose to the woman, with ring ready in hand. Cynics might even say that what the answer is depends on how good the ring is! There are two points here. The first is that more women are proposing than ever before, and more men are choosing to wear engagement rings, which are both big shifts away from years of tradition. Whereas couples have traditionally opted for wedding rings to be matching, those who both want to wear an engagement ring can now buy matching sets of tungsten engagement rings. While wearing a ring on the fourth finger of our left hand is symbolic of our commitment to one person, having the same design takes this connection even further. 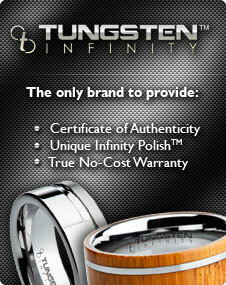 Of course, tungsten engagement rings are not just available as part of a matching set. Whoever is doing the proposing, there is a wide range of tungsten rings available for both men and women. In addition, tungsten is also a great option for someone who is choosing their partner’s wedding band without their knowledge. When we think back to the qualities we listed earlier, it is clear why tungsten bands are so popular. We want things like engagement and wedding rings to last forever, and tungsten is currently the only metal that can make this happen. The fact that they look great, and have a wide range of other positives, is an added bonus.